In recent years, we have successfully used technology to make our lives much more easier and convenient. It has become a way of life – it is everywhere around us and helps us simplify our schedules, commutes, lifestyles, and lives. This is especially true for people with disabiltiies. A while ago we saw how Microsoft was conducting a pilot program in the UK to help blind people navigate through a city without getting stressed about it. Something along the lines is soon going to be a reality in London, albeit via a different company. Wayfindr is a navigation system that allows visually impaired people to use their cell phones to get step by step direction to navigate independently through a city or a physical location without the need for asking for directions or assistance by others. The location has a bunch of beac ons (think sensors) attached in every nook and corner that communicate with the blind person’s phone. The moment a blind person enters that area, the beacons start sending instructions/ step by step directions on how they can get to their desired destination. These audio directions are received by an app on the phone. Just today, Wayfindr announced that it received $1 million from Google.org, Google’s philanthropic arm, to set up beacons at London’s busy Euston station, which gets around 3.4 million visitors daily. The bluetooth beacons will start providing instructions to get from point A to B within that station and also start collecting information which would be used to eventually create an open standard of guidelines that could be used by other similar systems or apps. In the future, a blind person may be anywhere in the world, they would easily use the beacons and their smartphone to navigate different parts of their local city. A solution like Wayfindr will not only bring independence to blind people but also faciliate accessibility to their jobs, and allow them to enjoy the city they live in. 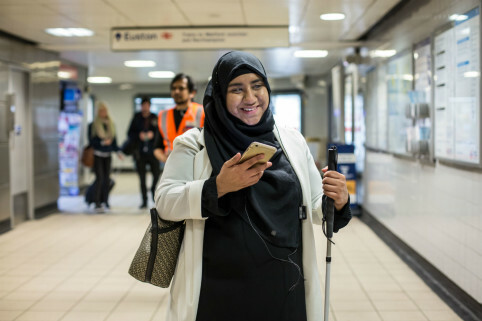 What’s also really great about Wayfindr is that visually impaired people wouldn’t have to spend money to buy another accesory – they would just use what they already would have. A smartphone. The grant will allow the Euston station project to acelerate over the next three years. If you are in London, keep an eye on the Euston station and watch how Wayfindr progresses over the next three years! Just wonderful, applause for all and all those people and companies involved in this project, in a few years would be great to have this development worldwide . What a good new.